Nimi Kular and her three sisters loved their mom’s Indian home cooking. But when they asked for recipes, she’d tell them to add a pinch of this spice and a dab of that. 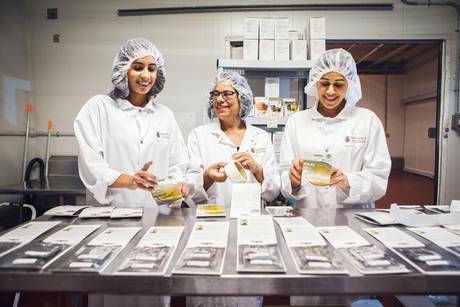 To help her daughters learn about Indian cooking, their mother, Jaswant Kular, began to mix up spice blends. “She knew if she didn’t make it easy, it would be lost to our generation,” admits Nimi Kular. The resulting mixes became wildly popular not only with her daughters, but with friends and relatives. And the family began to think about marketing them. “None of us had a background in the food business,” says Ms. Kular. “It was really a passion project.” The women rented a commercial kitchen in a friend’s banquet hall when it wasn’t in use. Together they’d roast, grind and blend the spices and package them for sale at local food shows and farmer’s markets. But as their business expanded, they faced a new set of problems. They needed more, and readily available, space to work in, as well as specialized equipment that would have to be stored. What’s more, they were plunging into unknown territory and sorely in need of advice from food industry veterans. 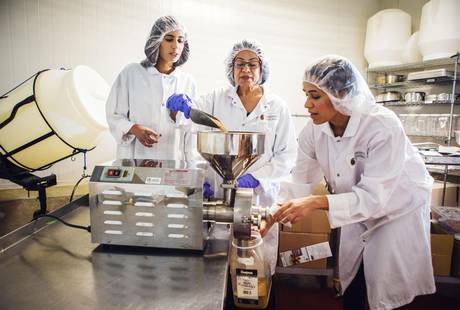 That’s when Ms. Kular came across a website for Food Starter, a not-for-profit accelerator for food startups launched last November, and one of the City of Toronto’s many initiatives meant to nurture home-grown manufacturing and food processing in the city. Even better, other businesses on the premises can offer advice on food safety, production, marketing and accounting. When the Kulars were seeking a distributor, for example, other Food Starter businesses arranged introductions and offered insight. 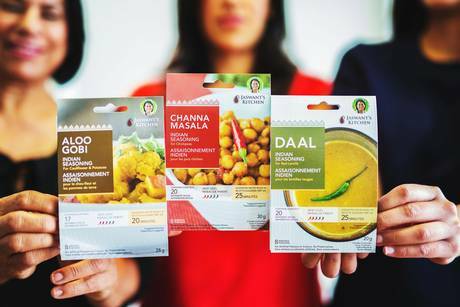 Jaswant’s Kitchen is one of many small manufacturing companies setting up shop in Toronto, thanks to the city’s concerted effort to replace old-style large industrial manufacturers with smaller, more entrepreneurial ventures. Rather than focusing on low-cost production of commodity goods, these companies often create unique, custom products in the area of technology, hardware, fashion and food. Food Starter works daily with dozens of such companies and many more are members, says executive director Dana McCauley. She believes the strength of Toronto’s future economy depends on developing such home-grown success stories. “Those companies will not necessarily be as tempted to move to the U.S. when they’re offered all kinds of tax incentives,” she says. Indeed, while it may seem like madness to try to encourage manufacturing and processing in the heart of the city, it makes good sense, says Chris Rickett, manager of entrepreneurship services for Toronto. “Manufacturing is still one of the largest employers in the city,” he says. It employed more than 130,000 Torontonians in 2015, according to Statistics Canada. The number of manufacturing firms has increased in recent years. “We attribute the growth to a lot more micro-manufacturing, as well as the ‘maker movement’” of independent inventors, designers and tinkerers, as well as tech hardware companies, says Mr. Rickett. What’s more, he says, new tech tools are making it a lot easier to open a manufacturing business. The upshot is that the timelines and barriers to starting a manufacturing company have been drastically reduced. That doesn’t mean, however, that opening a manufacturing or processing business in the city is easy. Space is at a premium, and labour costs are high compared with overseas locations such as India, China and Vietnam. Advice can be difficult to come by as well. The city hopes to at least partially fill the gap with a new dedicated manufacturing accelerator to be built in a residential condo building at Dufferin Street near College. It will operate similarly to Food Starter, offering shared equipment and services, mentorship and support to fledgling manufacturers. So the city proposed a novel solution: If the developer were to replace every foot of that employment space in one of the condo towers, the project could go ahead. The builder agreed, and the project was approved in June. Mitch Debora, a co-founder and chief executive officer of Mosaic Manufacturing, says that having access to such a space would have helped him immensely in getting his business off the ground. Mr. Debora and his three co-founders smelled an opportunity and founded Mosaic Manufacturing. “Our sole purpose is to expand the range of things people can make on a 3-D printer,” he says. Their first product, the Palette, converts low-cost 3-D printers from single-colour to multicolour printers at a cost of $1,000. A Kickstarter campaign to get the project off the ground raised $230,000, mainly from hobbyists, enthusiasts and artists – all of them willing to prepay for a product they wouldn’t receive for eight months or more. Toronto won out, largely because it would give them access to angel investors and venture capital firms, as well as plenty of talent. “There’s a really strong business and engineering talent pool in the city, which has helped us form a really strong core team,” says Mr. Debora. But finding space wasn’t easy. “We started by creating a document with all our requirements in terms of space, budget, locations, elevators, ventilation and so on,” he says. “We passed that around to a couple of realtors.” They looked at 10 to 15 properties over two months. In the end, they chose an office building at Church Street and Richmond. “We don’t do heavy manufacturing there, just assembly, quality control and shipping,” says Mr. Debora. The other occupants include law firms and recruitment offices, so there’s no one to bounce ideas off of or consult regarding manufacturing-related issues. Eventually, though, once the bugs are worked out, Mr. Debora expects to manufacture offshore. “The way products are manufactured now, it makes so much sense to have them produced in countries where labour is cheap – like China,” he says. Certainly urban manufacturers in Toronto can’t compete with offshore locations in terms of labour cost. That’s why many of the city’s new manufacturers are small-scale operations focused on limited run, high-quality specialty items, says Tony Mammoliti, owner of YNOT. In 2010, Mr. Mammoliti cleared out a space in a friend’s garage, bought a used sewing machine on Craigslist and started production. His product line has since expanded to include bags, tool rolls and other bike accessories that are sold around the world. Nonetheless, he says, new online tools have had a tremendously beneficial effect on the city’s small manufacturers. YNOT has raised about $200,000 through Kickstarter campaigns in the past three years, and the platform gives the company a bigger-than-usual purchase order with higher margins, since the sale is direct to the consumer. “I think that has helped urban manufacturers,” says Mr. Mammoliti. In addition, tools like Etsy (a global online marketplace) and Shopify (build your own online store) make it easy to find a market for products online. The ultimate irony: That would effectively eliminate many of the high-value jobs the city has been working so hard to save. Toronto isn’t the only city seeking to harness the power of micro-manufacturing to generate jobs and revenue. Here’s a sampling of what’s going on in other cities, as well as Toronto. Catalyst137: This gargantuan, 475,000-square-foot innovation complex in Kitchener-Waterloo, Ont., is set to open next summer. While the region attracts more than its share of tech startups, Catalyst137 targets hardware development firms, offering rental units from 2,600 square feet to 60,000 square feet, as well as a shared manufacturing space, a testing facility and commercialization services. If all goes according to plan, it will be larger than HAX, a hardware accelerator with locations in Shenzhen, China, and San Francisco. Made in Montreal: A non-profit website aimed at promoting and supporting local manufacturing and “buying local” in the city. Projects include meet-up events, research and advocacy, and a Web series that showcases manufacturers, from clothing designers to hat-makers to mosaic creators. Built in Montreal: An online directory of resources, events and jobs. Toronto Made: Created by Derek Brunelle, this non-profit website offers a directory of local manufacturers and business resources. Startup Here Toronto: A directory of business support for entrepreneurs that includes pre-incubation programs, incubators, accelerators and co-working spaces. Apparel Innovation Centre: This Calgary centre provides businesses with services to test, design and manufacture innovative apparel. The state-of-the-art facility has the only full-scale thermal comfort testing chamber in North America, and the only full-scale hot fluid and steam protection testing chambers in the world. Maritime Makers: In co-operation with city government and local agencies, Maritime Makers has successfully piloted more than 100 events including their city’s Etsy Made in Canada, Nova Scotia’s largest one-day selling event for creative entrepreneurs. Correction: A previous version said the Apparel Innovation Centre was planning to open in Jan 2017. In fact it is already open.